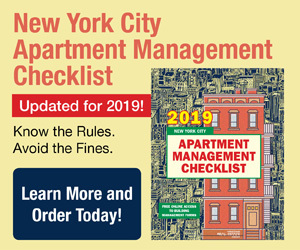 Each month Landlord v. Tenant provides approximately 60 summaries of recent landlord-tenant court cases and agency decisions. 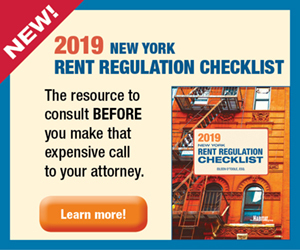 Landlord v. Tenant covers more than a dozen courts and agencies, including the NYC Civil Court, NYS Division of Housing and Community Renewal (DHCR), NYC Environmental Control Board, and many more. 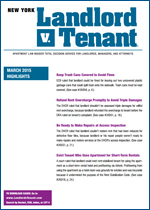 Now available online, Landlord v. Tenant takes readers through each dispute, streamlining research and arming landlords with the legal ammunition they need, quickly and easily. Get instant access to our dynamic database of cases that go back to 1993. 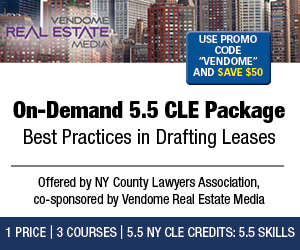 Move seamlessly between specialized online sources, including the New York Landlord v. Tenant newsletter archives. Download full-text case decisions and opinion letters - information not available anywhere else. Use Boolean operators AND, OR, and NOT to include or exclude search terms. Surround multiple terms in double quotes "" to search for those exact phrases. [Baer v. Gotham Craftsman Limited: NYLJ, p. 21, col. 3 (12/15/92) (App. T. 1 Dept. ; Ostrau, PJ, Riccobono, Parness, JJ)]. [Esco Associates v. Coriou: NYLJ, p. 32, col. 1 (12/3/92) (App. T.2 Dept. ; Kassoff, PJ, Joy, Scholnick, JJ)]. [Athineos: DHCR Adm. Rev. Dckt. No. EK 230355-RT (11/19/92)]. 4-page document. [Forest Hills So. Co-op: DRA Dckt. No. EL 130026 B (11/3/92)]. 1-page document. [5524 Realty Associates: DRA Dckt. Nos. ZFH 210025-RK; ZEC 210147-OM (11/13/92)]. 1-page document. [Fox v. New York City Housing Authority: NYLJ, p. 26, col. 5 (12/30/92) (App. T.1 Dept. ; Riccobono, JP, Miller, McCooe, JJ)]. [El-Nazer v. Briggs: NYLJ, p. 25, col. 5; El-Nazer v. Bass: NYLJ, p. 26, col. 1 (12/8/92) (App. T. 2 Dept. ; Kassoff, PJ, Aronin, Joy, JJ)]. [City of New York v. Barnett: NYLJ, p. 25, col. 6 (12/8/92) (App. T. 2 Dept. ; Kassoff, PJ, Aronin, Joy, JJ)]. [Wyper: DHCR Adm. Rev. Dckt. No. GG 410115 RT (12/2/92)]. 2-page document.